Four people have been arrested as part of an investigation into unfair practices in the ticketing market. National Trading Standards officers carried out raids on four separate properties on Tuesday. As well as the arrests, they seized computers, mobile phones and storage devices as evidence. The action was focussed on "businesses that buy and sell tickets in bulk". The identities of those arrested and raided haven't been made public. National Trading Standards officers have been looking into the issue since April, targeting so-called "power-sellers" who harvest dozens of tickets for gigs, musicals and sporting events as soon as they go on sale, then pass them on for inflated prices. Often, those tickets are re-sold in violation of the original terms and conditions, making them invalid. 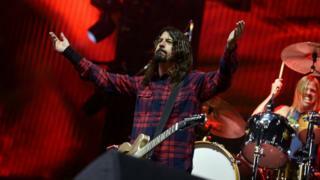 This recently affected dozens of fans who bought tickets to see Foo Fighters at the O2 Arena from secondary websites such as StubHub or Viagogo. Those who could not present photo IDs matching the names on their tickets were turned away. Failing to inform customers of such restrictions, or providing other misleading information, is a breach of the Consumer Protection from Unfair Trading Regulations 2008. Tuesday's arrests were made on suspicion of breaches of those regulations. The action comes a month after the Competition and Markets Authority raided the offices of ticket resale companies StubHub and Viagogo as part of a separate probe into suspected breaches of consumer law. Officials seized information about the companies' relationships with prominent touts who use the two sites to sell tickets. Several high-profile bands, including the Arctic Monkeys and One Direction, have called for tighter enforcement action on such sites. Under the Consumer Rights Act, offending sites face fines of up to £5,000.